Every business owner wants to succeed. But achieving success doesn’t come easy to most entrepreneurs. 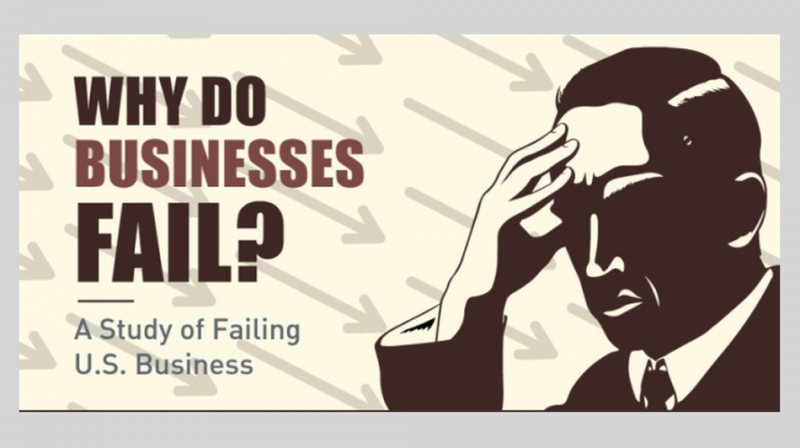 Fifty percent of small businesses, in fact, fail in their fifth year. This shocking revelation comes from new data presented by online insurance service provider, InsuranceQuotes. But what causes these businesses to fail? The InsuranceQuotes report offers some interesting insights. Statistics reveal majority of small businesses (82 percent) fail because they experience cash flow problems. Other factors contributing to their failure include no market need for products or services (42 percent) and running out of cash (29 percent). Businesses cannot succeed unless there’s demand for their offerings in the market. That’s why, it’s essential for you to invest in the right idea and flesh it out properly. Data shows healthcare and social assistance (1st year: 85 percent, 5th year: 60 percent) has the best survival rate. Transportation and warehousing (1st year: 75 percent, 5th year: 30 percent), on the other hand, has the worst survival rate. Think you have found your winning idea? Give it a test run before going out in the market. A minimum viable product (MVP) can help you gauge audience response to your product before it’s launched. You may post a video demo of how the product will work or showcase it on your website. With an MVP, you can minimize risks and make necessary tweaks to your solution before offering it to your target audience. It’s further important for you to communicate with your audience to engage them. You may create an online community to obtain useful insights. Engaged customers tend to be more loyal customers. It’s therefore a good idea to use online platforms to connect more closely with your target audience.